separate oil tank, no need for pressure test certificates (up to RSF 45.0). Door panels are easily removed allowing easy access to the individual components for servicing. 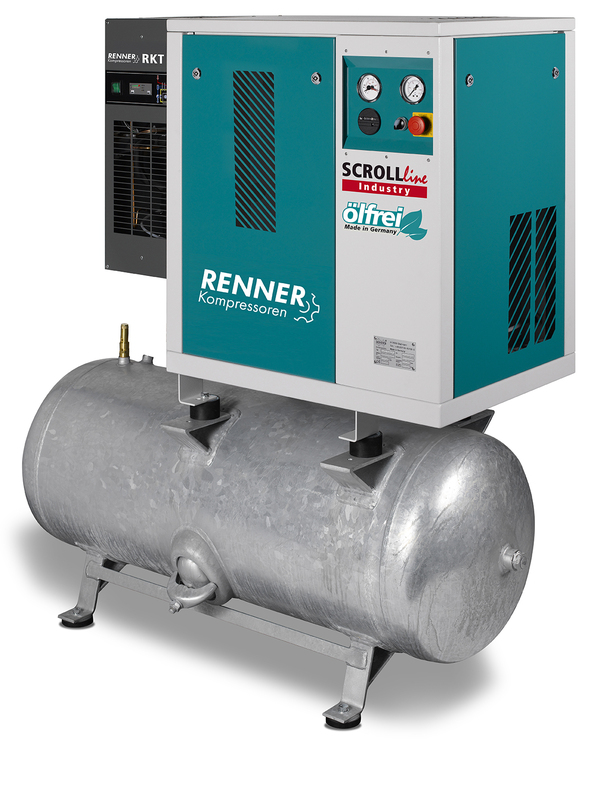 RENNER piston compressors cover the small and middle compressed air requirement. 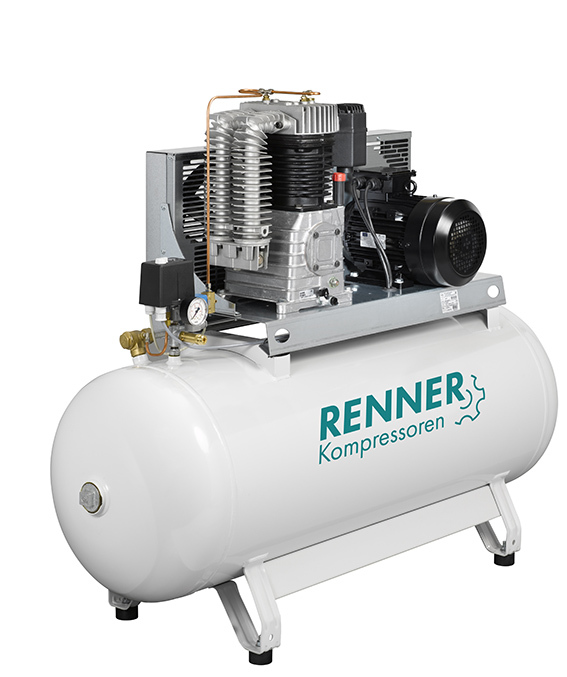 Beside mobile and stationary piston compressors , RENNER offers also stand – by compressors. All piston compressors are characterized by a high reliability and a low rotation speed. Only high-quality components find the way into a RENNER parts list. Centrifugal separation of liquids from compressed air up to 99% Cyclone separators extract water and coarse dirt particles from compressed air by means of the centrifugal effect and are installed directly behind the screw compressor. The incorporated deflector plate creates a spinning movement resulting in a cyclone-like, upward stream of compressed air inside the enclosure. The special design of the lower section of the filter enclosure, and the use of a mushroom-like shield over the condensate collecting chamber, ensures that separated aerosols cannot be carried away. This optimal construction ensures low differential pressures at high flow rates. Efficiency is at 99%. Temperature limits at the installation site of a maximum of 80°C and a minimum of 2°C must be observed. The design, manufacture and conformity assessment is in accordance with Pressure Equipment Directive 97/23 EC for Group 2 fluids. Advantages and characteristics: Very low maintenance cost/easy to install/high-performance automatic deflector/robust aluminium enclosure. Optional: Electronic steam trap. 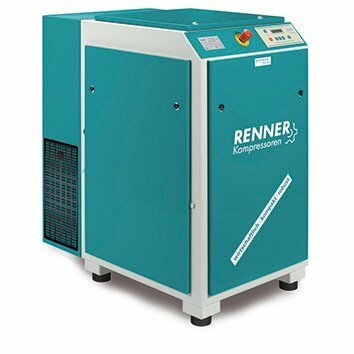 RENNER compressed air filters are suitable for separating oil and water aerosols as well for the removal of solid contaminants from compressed air. Even dust is securely kept in the surface and deep into the filter material. A filtration efficiency of almost 100 percent is reached through the use of various filtration mechanisms, such as separation by direct trapping, inertial impact and Brownian motion. The standard filter is fitted with a mechanically controlled steam trap. The robust aluminium enclosure is coated with a polyester resin and is therefore particularly resistant to aggressive condensates. The turbulence-free area in the lower section of the filter enclosure ensures that the already separated condensate is not carried away out of the wet area with the clean air stream. Pleated compressed air filter elements consume extremely little energy due to the very low differential pressures. The initial low differential pressure therefore remains at a low level for its entire service life. Temperature limits at the installation site of a maximum of 60°C and a minimum of 2°C must be observed. The high quality requirements of DIN ISO 8573 are fulfilled with ease. These filters are LLOYD’S-certified under KLR0403771 with the CE symbol and the CE declaration of conformity.The design, manufacture and conformity assessment is in accordance with Pressure Equipment Directive 97/23 EC for Group 2 fluids. The dryer has a cooling system that cools the compressed air. In this process, the water vapour saturation limit is lowered resulting in condensate that is removed by the steam trap. The greater the cooling temperature differential of the compressed air, the higher the condensed water volume. The lower the cooling temperature of the compressed air, the lower the moisture content.The lower limit of the compressed air cooling arises from the working principle of the dryer, i.e. that moisture separation in liquid form can only occur at temperatures above the freezing point of water. 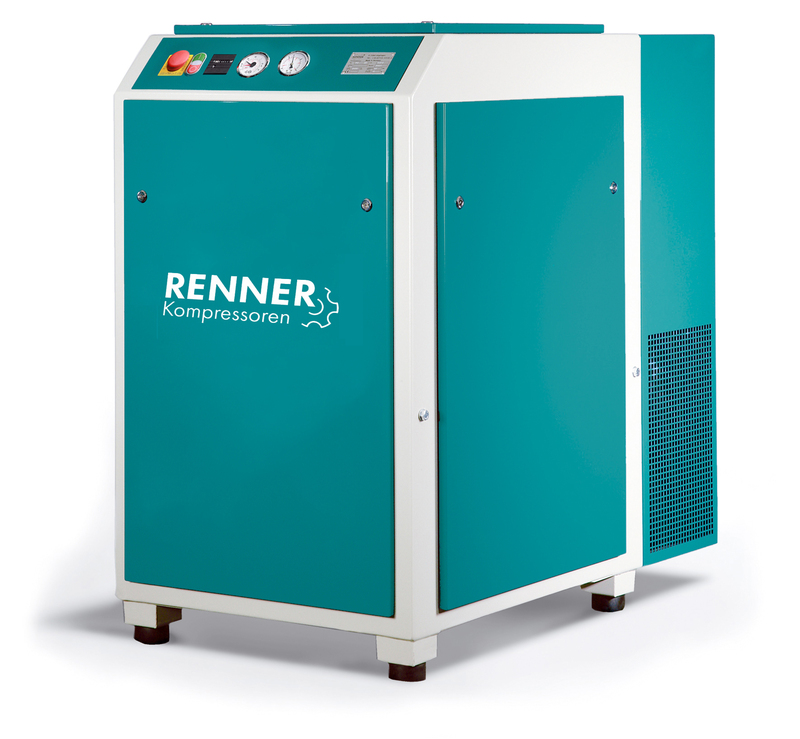 The RENNER refrigeration dryer can be mounted on the console or the wall by means of flexible suspension. RENNER steam trapThe condensate flows into the steam trap via the intake line (1) and collects in the enclosure (2). A capacitive sensor (3) continuously records the fill level and signals the electronic controller as soon as the tank is full. The pilot valve (4) is activated and the membrane (5) opens the discharge line (6) to discharge the condensate. When the steam trap has been emptied, the discharge line is closed again quickly before unnecessary compressed air losses occur. RENNER oil/water separatorsThe oil-bearing condensate flows into the settling chamber under pressure. This relieves the overpressure without causing turbulences in the next separation tank. Any coarse dirt particles present are retained in a removable collection container. In the separation tank, the oil is deposited on the surface by means of gravity separation and guided to the oil collection container. This pre-cleaned condensate now flows to the filter stage. The pre-filter binds the residual oil drops in its material and the last oil residues are safely and reliably retained in the main filter cartridge. The treated condensate exits the oil/water separator via the water outlet. Compressed air supply must work reliably and economically. RENNER intelligent control systems ensure this for both individual and multiple compressor stations. RENNERconnect incl. webserver is a higher level, intelligent control system for optimal management and monitoring of your compressed air station. Heat recovery – saves money and saves the environment! When using screw compressors, besides the desired primary product – the compressed air – a lot of heat is produced. 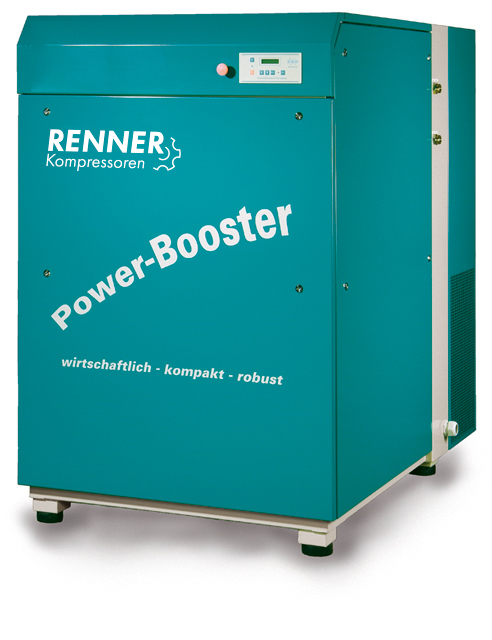 RENNER developed a heat recovery system. It enables you to recover up to 85% of the applied energy as heat in the form of hot air, industrial water or heating water. It is environmentally reasonable and saves a lot of money! A benefit of the external heat exchanger is the simple installation. A plumber will look after the integration into the existing water circulation. For the operation no external energy is necessary!